Halloween is a huge event on college campuses across the country. My roommate and I have created costumes together the past few years and they’re generally a big hit among our friends. In the months leading up to Halloween we bounced around a few ideas. 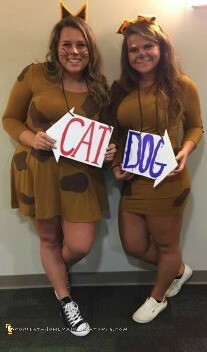 But our favorite and our final decision was to dress up in a CatDog costume. The TV show CatDog was a huge children’s show starting in 1998 through 2005. The show based on a cat and a dog are stuck together and have very different clashing personalities. Ironically the personalities of the cat and the dog kind of fit the personalities of myself and my roommate, so we decided on which we would be accordingly. To create the CatDog costumes we purchased dark mustard yellow colored dresses from Forever 21 (for about 10 dollars each). To create the spots we cut out brown felt dots and hot glued felt to the dresses. We created ears using dollar store headbands, brown felt, yellow felt, pipe cleaners, and hot glue. To create the signs that the cat and the dog had we bought white foam board, drew the respective logos, cut them out with exacto knives, threaded string through the corners and hung them around our necks. Finally we painted our faces in the same design as the typical cartoon. Just a little disclaimer: my roommate and I decided against going all out and actually attaching fabric between the two of us so that we would actually be connected. It seemed like a decent idea but not very functional at all. We like to be around each other but not that much. This costume was a big hit at our college, really going with the late 90s – early 2000’s kids. We went to a few different places and everyone knew exactly what we were going for. Overall I think it was one of our best costumes yet.